When Utah State first began recruiting Kyisean Reed, these two photos popped up on the USUFans.com message board. Many fans were questioning whether on not the photos were real. 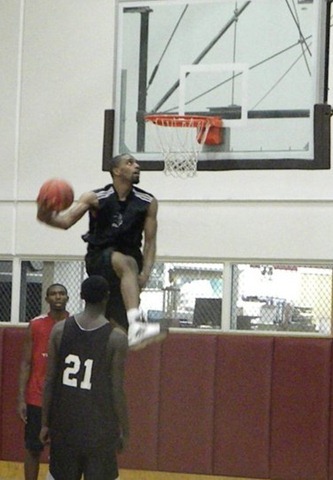 Can he really jump that high? Is there a little trampoline out of the photo? I think it’s safe to say that Kyisean has answered those questions. The guy is for real. The Gossner Classic has been somewhat of a coming out party for Reed. 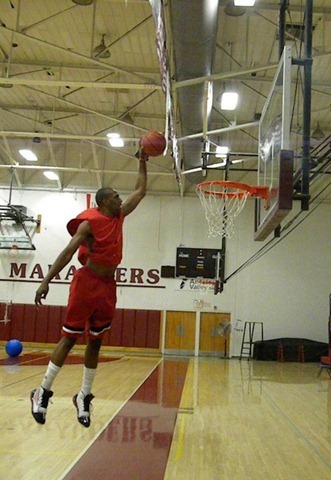 He has demonstrated his athleticism through a variety of dunks and blocked shots. One of his dunks against UT-Arlington should go down in Aggie lore. If only we could find some video footage of it… Reed completely posterized the UT-Arlington defender making what was an incredible athletic feat seem quite easy. He has also shown an ability to alter and block shots, swatting away five shots in the last three games. Reed has also become one of Brockeith Pane’s favorite targets for alley-oop plays, and we can only hope that continues as the year goes on. Not only is Kyisean an incredible athlete, but he is also proving to be an incredibly efficient scorer. On the year, Reed is shooting 63% from the field, good enough to place him #7 all-time in Single Season FG% at Utah State. After a slow start to the season, Reed has averaged 14.1 point per game over the last 7 games, including a career high 27 points last night leading the Aggies to a convincing 81-62 victory over a quality Kent State squad. If Kyisean can continue to perform at this high level, there are good things in store for the Aggies this year. Utah State’s Preston Medlin had a career night on Tuesday in a win over UT-Arlington in the first game of this year’s Gossner Classic (a.k.a. Athletes in Action Classic Sponsored by Gossner Foods). Medlin came out on fire right from the get-go, hitting his first four three point attempts helping build a 20-8 lead for the Aggies. 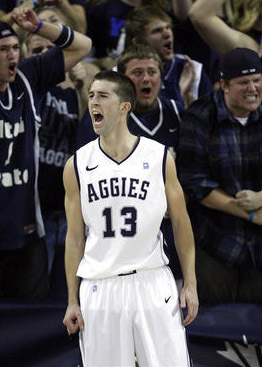 The Aggies never looked back and ended up winning the game 73-69. While the final score is somewhat close, that is mainly due to a flurry of three point makes by UT-Arlington in the last minute of the game. The game was never really in question. Medlin finished the game with a very impressive stat line. He had career highs in points (27) assists (8), and steals (2), and pulled in 4 rebounds. He was terrific shooting the ball going 8-12 from the floor, 6-9 from downtown, and 5-6 from the free-throw line. With Brady Jardine out with an injured foot, Preston Medlin has taken on the leadership role for this team. He’s shown confidence, passion, and a will to win. Medlin’s shooting performance also moved him up in the record books. He now ranks #5 all-time in Career 3PT FG% at 44.8%, and #4 all-time in Single Season 3PT FG% at 49.1%. Danny Berger and Kyisean Reed also moved up in the record books after solid performances last night. Berger went 4-7 from three, moving him into the #6 spot (tied with Brian Green’s 2010-11 season) in Single Season 3PT FG% at 46.9%. Kyisean Reed continued his offensive dominance with another 13-point performance while shooting 4-5 from the field. This moved him into the #9 spot in Single Season FG% at 60.4%. The Aggies face off against the St. Peter’s Peacocks tonight at 8:05 Mountain Time. With another good shooting performance against Seattle, Preston Medlin moved into 6th place in Career 3FG% at 42%, and 8th place in Single Season 3FG% at 45.8%. Danny Berger entered the Single Season 3FG% list as well coming in right behind Preston Medlin at #9. Adam Thoseby is knocking on the door at 41.2% from downtown thus far, but needs to make more treys to satisfy the 1 make per game requirement. Following in the tradition of great Aggie post players, Kyisean Reed has been impressive thus far in FG%. He is currently #20 in Single Season FG% at 58.3%. At the risk of jinxing him, we’re happy to announce that Danny Berger has yet to miss a free throw in his Utah State basketball career. Danny is shooting a perfect 8-for-8 thus far this season. He is shooting so well, that we actually broke USUStats.com when we tried to enter in his percentage. The highest it would allow us to enter was 99.9%. Our apologies Mr. Berger. Needless to say, Danny has sole control of the #1 spot in the Single Season FT% list. While Brockeith Pane’s percentages from the line are down slightly this year (76.1%), his career percentage is still good enough for #16 all-time in Career FT% at 79%. 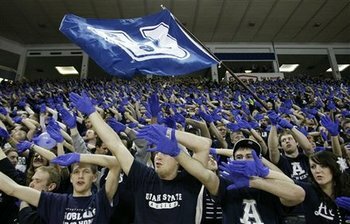 Is Utah State’s Student Section Number 1? Eamonn Brennan and Dana O’Neil from ESPN.com have recently written an article asking fans to let them know who has the best student section in the nation. San Diego State’s “The Show” has provided them an overwhelming response including this writeup on their official site as well as a boat load of tweets. 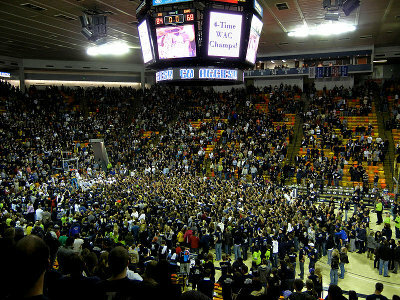 Utah State has 4000 student tickets and they make some type of impression on the visiting team and it’s just a party. It is one heck of a party. It’s the best I’ve ever seen. In many, many years I’ve been at Duke and Kentucky and UConn and Syracuse and it’s clearly the best I’ve ever seen in terms of atmosphere. “It’s the toughest place to play,” said Saint Louis coach Rick Majerus, who coached Utah against Utah State every season of his tenure there and played at the Spectrum every other year. “I’ve been to Duke. I’ve been to the Pit. I’ve been to Indiana, Minnesota, Purdue, Arizona and around the country. I know the dynamic may change since it’s Utah-Utah State. “It’s the only show in town,” he said. “The fans sit right behind you. The arena is really tough. It’s difficult to get to. You have to fly into Salt Lake City and drive in the winter on this treacherous drive that’s like a driveway to death. Got more quotes, YouTube videos, or pictures to add? Make a comment below! Some of you might remember an article from last summer about Jared Stutzman, a 2014 recruit. Stutzman is a sophomore this year and is contributing in a big way for Bonneville High School in a big way. Here’s a highlight clip from a recent game against Idaho powerhouse Highland High School where Jared scores 26 points, grabs 16 boards, blocks 3 shots, and dishes out 3 assists. Adam Thoseby and Preston Medlin have been on fire so far this year from beyond the arc. 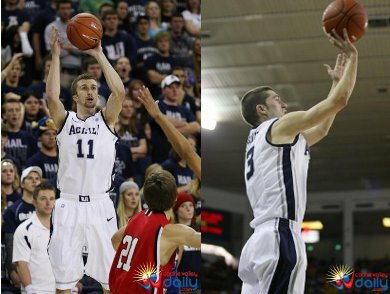 So much so that they have each entered the Utah State record books for 3 point shooting percentage. Thoseby is 7-14 from downtown this season (.500) which places him tied for 1st place on the Single Season 3FG% List. Medlin is 14-29 (.483) which is good enough for #5 on the Single Season 3FG% List. He is also 29-69 (.420) in his career placing him at #6 all-time in Career 3FG% (Minimum 25 made). Aggie Students: A Call To Arms!! Our good friends over at The Sagebrush Spot have written another great article on Spectrum Magic and have pulled an all-nighter to provide us with one of the most EPIC Aggie Basketball videos ever made. But before we get to that, let me just say this…. Many players on this year’s team, as well as recruits that have committed to become Aggies in future years have committed to Utah State for one reason. SPECTRUM MAGIC. Let’s give it to them like never before and make this year’s basketball season unforgettable! And now for the video… Enjoy!